Home » Mobility » Walkers and Rollators » Best Rollator for Outdoor Use: Getting Back Outside for Sun and Fun! Are you a senior who likes to spend a lot of time outdoors? Tired of mobility and health problems keeping you indoors? Maybe you don’t feel safe when going outside? Or, do you care for a loved one like this? If yes, then an outdoor rollator is something you should consider! Often, regular rollators and walker get stuck in sidewalk cracks or potholes. They make moving around outside very bumpy. When walking through parks, they don’t do well on rocks or wet grass either. This makes using one in these areas not safe. The best rollator for outdoor use is a walker with big wheels. Some of my favorites are below. Medical equipment should be discussed with or prescribed by a doctor, therapist, or other health professional. They know you and your medical history. I don’t. Always follow their advice. Nothing in this article should be construed as medical advice. Outdoor Walkers with Bigger Wheels! Rollators for outdoor areas have large, heavy duty wheels that move smoothly across varied ground. They have comfortable handles that also give you a comfortable but firm grip. Optional features like height adjustments and a carrying basket are important to consider. The larger tiresmake the biggest difference though! And rollators almost always have bigger tires than standard walkers! Learn more about rollators and how they are used by clicking here. Here is a list of the best rollators to use outside from my professional point of view. Scroll down below the list to read more details for these products. NEW FOLDING DESIGN: Unique folding design allows you to fit your rollator in the trunk of your car. 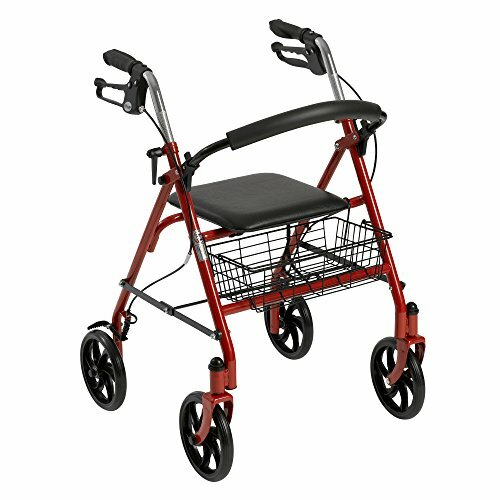 The front wheels are easily removable and rear legs fold upward, allowing you to fit your new rollator in the tightest of spaces. SAFELY STORE ALL OF YOUR BELONGINGS: Comes equipped with a storage bag and a cane holder for added convenience. Neatly store your wallet, laptop, drinks and snacks. 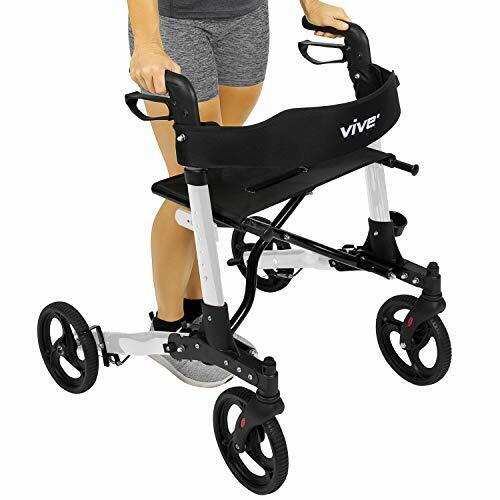 DUAL BRAKING SYSTEM: Ergonomic handles are accompanied by an easy-to-use braking system that can be locked when you do not want the walker to roll. Comes equipped with a storage bag and a cane holder for when you need to step away from your rollator. WIDE SEAT & STURDY BACKREST: Stroll in comfort and style. The extra wide seat accompanied by a sturdy backrest for comfort and security. Ok, I am going to start you out with one of my favorite rollators – period! This walking aid has the large 8″ casters that others in this category have. But, there is a difference. The front wheels are “sport tires” and have a little tread on them. Most other rollators only have smooth tires. Yes, most rollators fold quickly for travel and storage. But, not like this Vive model does. It folds in half using an X shaped cross brace. But, the rear legs also fold up leaving a very small package to handle. Check out this video to see how much easier it is to fold and load. Another extra feature is a built on cane holder. This is an extra cost on most other rollators. It doesn’t skip any of the standard features either. It also has adjustable height arms to fit users between 5′ and 6′ tall. Hand brakes and a storage bag are also part of the package. Drive Medical makes some of the most popular mobility assistance products available. And, this is one of their top selling walking aids. It also has great outdoor capabilities. 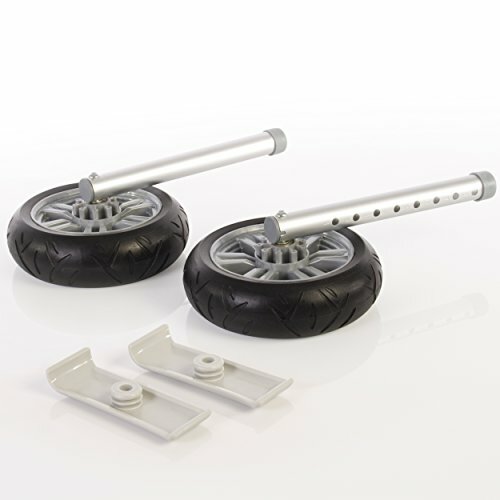 The 7.5″ casters wheels will maneuver along the uneven ground of an outdoor area. But, they are also gentle enough for indoor use too. It’s a multi-purpose device. You won’t have to think twice about where or when you can use it. The padded seat and backrest give the person using it a nice place to rest when needed. The seat is 21″ off of the ground which should work well for most people. This rollator weighs almost 19 pounds one folded for loading. The backrest and basket are removable to lighten it up a little. The Nitro Euro Style model is another great choice from Drive Medical. 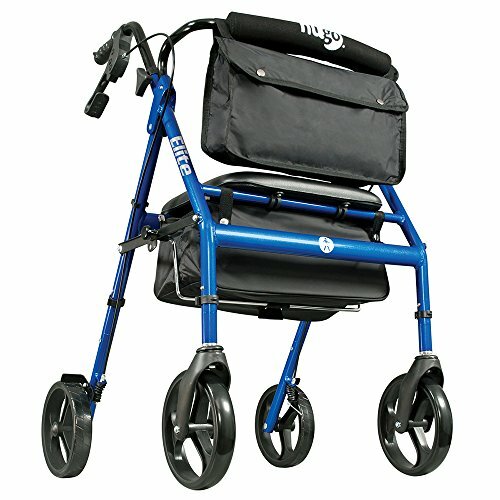 This one is a more premuim model of rollator with some unique styling details. But, the primary advantage of this one is the design of the wheels. They are 10″ in diameter and a bit larger than the back ones. This gives you more control and stability when handling outdoor terrain. The folding mechanism is unique too. It folds quickly for travel like a wheelchair using a cross brace design. This leaves a smaller footprint for storage and transportation. The storage bag is even designed to fold without removing it first. The Nitro even comes in sizes (Petite, Standard, and Tall) to fit a wide height range of users. The handle heights are also adjustable for fine tuning the fit of the walker. Three colors are available: black, white, and red. Another solid choice is the Hugo Elite. It has the large 8 inch wheels that are necessary for use outside. Other standard features include hand brakes, an under seat storage pouch, plus adjustable height handles. The Elite also has a few extra features not on some of the other models. The padded seat is height adjustable with a 2″ range. This is important because it helps the person keep their feet on the floor for stability. It also comes with a saddle bag that mounts onto the padded backrest for extra storage. It’s easy to fold and about the same weight as the others at about 18 lbs. Manufacturer claims it will fit seniors betwee 4’3″ and 6’2″. It is available in blue or red. Oversized heavy-duty wheels with treads are perfectly suited for grass, dirt, and other rough terrain. Included pair of deluxe skis makes for easy gliding over uneven surfaces. Quick and simply installation-no tools required. 8" wheels with 1" dia. aluminum tubes. Here is another option for you! 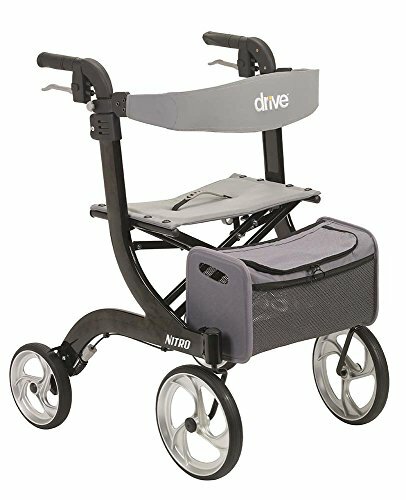 Convert your existing walker and make it more outdoor friendly! This kit includes a pair of 8″ diameter wheels that are also 2″ wide. The wheels are attached to a pair of walker extension legs. This allows you to pop you the extension off you existing walker and snap these on in its place. Most standard walker wheels are 5″ in diameter so bumping up to an 8″ wheel makes a big difference. A pair of extra large glide skis are included to put onto the back legs of the walker. Be careful though because it is easier to get them caught on large cracks or debris while outside. Don’t add to your health problems by risking a fall! Note that they only attach to a standard four legged walker. They will not fit on an existing rollator. Many rollators maneuver well outside on sidewalks, yards, and pavement. Look for wheels that are at least 8″ in diameter for a smooth roll. All the products above are among the best rollators for outdoor use. But, my favorite of the bunch is the Vive model. The folding frame with collapsible rear legs is hard to beat for transportation. The sport wheels with tread are another nice upgrade over a standard rollator too. I hope this guide helps you choose a safe, outdoor rollator that you can use to enjoy some fresh air and sunshine. Do you have any tips for getting outside with your rollator? Please leave them in the comments below. Also, I would love for you to share this on your favorite social media account if you found it helpful! I’ve had it for 3 years and I bought a second one so I could keep one in my car, and one on my deck for walking in my neighborhood. I use it all the time when walking my dog. Being able to simply turn around to sit down is a terrific feature! All the others make you walk around their rollator to sit! To me, that’s an accident waiting to happen. I returned the Drive rollator, which was my first purchase, in favor of the Roscoe, and I never regretted it. I often suggest it to others needing the help of a rollator. Forgot to add that you can buy the Roscoe on Amazon!